Ah, Zandvoort! The classic Dutch dune track might not be as evocative in its current state as it was during the years it was a regular part of the World Championship but the fame of some of its corners still put awe into the most ardent Grand Prix followers. Hunzerug, Scheivlak, Hondenvlak, Bos Uit… (recently renamed the Arie Luyendijkbocht) and of course, Tarzan! Conceived in the immediate post-war years to give the Netherlands a place on the international racing calendar, the original Zandvoort track with its elevations, its long and winding full-throttle and often off-camber corners and its long finishing straight approaching the slightly banked Tarzan 180° was immediately considered a real drivers' track. Apart from all that the dune sand blowing across the track posed an extra challenge as your tyres were treading on treacherous ground as soon as you endeavoured to go off-line. On the other end of the scale, Tarzan was - and still is - a corner without a set "line", allowing you to take all sorts of approaches, entries and exits and still be racing your rivals - thanks to its banking. Tarzan always gave you a feast of overtaking manoeuvres - on the inside, on the outside - that could go wrong at any time. And so they did more than often, as you never knew what line your opponent was going to take. Would he be breaking at the latest, taking an outside line only to cut back to the apex with speed? Would he dive into the inside, breaking into the corner, bunching up on the exit but holding you at bay? Would he stay in the middle, defending both of his sides? Or would he overcook his move and head for the barriers or inch wide on the grass on his exit, putting him in a twirl that might come back in your face? At Tarzan, you could lose a few as easy as you won them. Just ask James Hunt and Mario Andretti. Or Alain Prost and Nelson Piquet. Zandvoort's permanent race track was completed in the early years after the war but the seaside resort already had seen some racing in the immediate days before the outbreak of World War II. Zandvoort's visionary mayor Van Alphen had managed to attract the best Dutch racers to put on a show in Zandvoort's streets. A temporary eight-shaped circuit was laid out in the northern part of town, comprising the Vondellaan and the Van Lennepweg. Today these roads lead up to the main gates of the race track. The event saw several touring car races, with the undoubted highlight being a demo run by Manfred von Brauchitsch in his Mercedes W154. Things were shaping up for the creation of Holland's first permanent race track. That is, until the Nazis decided to invade their neutral neighbour at the North Sea. In the first days of May 1940 the Netherlands were trampled under foot, and the plans for a permanent circuit were the last thing on Zandvoort people's minds. But Van Alphen's vision was not lost in the war. Au contraire. Just months into the German occupation the mayor rekindled his ambitions. In 1941 a map was presented at the Annual National Fair in Utrecht, on which a track-shaped road can be seen winding through a new park area that is envisaged to appear on the north side of town. Also included in these plans was the erection of a new forest, with connecting roads leading through it to link up with the streets that formed the temporary race track in 1939. But how could they actually go on and build the darned thing? There was this tiny matter of a war going on. Leave that to Van Alphen. The cunning mayor did not just order to start work on the project, he even managed to con the occupying forces into helping him build the foundations! With some 40 hotels and 600 coast-line houses demolished and Zandvoort's northern part cleared off the face of the earth to prevent the allies from using the Zandvoort beach as a landing site, the north side of town was far from a glorious park area. It was a ruinous mess. But Van Alphen made the proud Germans believe that he wanted to pave the way for a Paradestraße to honour the victors of the war. They fell for the ploy blindly - with a striking immediate result: many of Zandvoort's workers were not put on transport to Germany to contribute to the Nazi war effort but stayed behind to clear the ruins and turn them into the Parade Road's first layer of foundation. The Germans were well satisfied with the Dutch gift but of course Van Alphen had quite another type of victory celebration in mind for the end result… Unsurprisingly, to this day the circuit's official name is the Burgemeester Van Alphenweg (Mayor Van Alphen Road). After the war the mayor was on his own with his plans to complete the circuit on top of the layers of rubble. As most European countries the Netherlands were on the rebound of five years of German occupation. The country was virtually bankrupt and all effort was channelled to rebuilding the nation's vital infrastructure. Zandvoort and the Royal Dutch Automobile Club (KNAC) decided that they would do the work themselves, and got together with members of the Royal Dutch Motorcycling Association to determine the shape of the track. In July 1946, 1927 Le Mans winner Sammy Davis was brought in as a track design advisor. Tarzan was part of the earliest plans, and the rest of the lay-out was simply created using the existing roads in a sensible way. As an aside, famous track designer Hans Hugenholtz cannot be credited - as he is often done - with the design of the Zandvoort track, although he was heavily involved as the Nederlandse Automobiel Ren Club chairman (NARC, the Dutch Auto Racing Club) before becoming the first track director in 1949. He did take a leaf out of the Zandvoort book when designing such tracks as Suzuka and Zolder. In February 1948, mayor Van Alphen went into retirement, throwing the finalisation of the project into serious doubt. But his successor, H.M. van Fennema, continued where Van Alphen left off and set about completing the circuit with its top layer. They worked all through the spring of 1948 to finish the pit area and a modestly sized grandstand - and couldn't wait to get the first race started. With no previous organizing experience in the field of motor racing events the KNAC wisely decided to contact Desmond Scannell of the British Racing Drivers Club, the BRDC secretary agreeing to organize the first Zandvoort Grand Prix. And so the first race at Zandvoort became a British national event, albeit one with a fine turnout of 21 entries, of which some 14 cars appeared on the final's grid on August 7, with many of the big British names present and accounted for. The entry was led by Reg Parnell's Ambrosiana 4CLT and Prince Bira's Chula-entered Maserati 4CL, with Duncan Hamilton and Anthony Baring bringing their 6CMs. The ERA fleet was headed by the later Autosport reporter John Bolster (in Bira's old R5B "Remus", also previously raced by Tony Rolt) and also saw cars driven by David Hampshire (R1A), Fred Ashmore (R2A), Geoffrey Ansell (R9B) and Leslie Brooke (in the works R7B), while Leslie Johnson (in the works ERA GP2 E-type) and Peter Walker (R10B) suffered problems during their heats and were non-starters for the final. Further variety was provided by the Alta (F2-2) of Geoffrey Watson, the two Bugattis of Kenneth Bear (59121) and Michael Chorlton (a T51), and the Anglo-Italian concept that was called the Aitken-Alfa Romeo Special, originally based on the Alfa Bimotore 5.8-litre, here raced by Tony Rolt and Kenneth Hutchinson. It was enough to compensate for the non-starts of Abecassis' Alta, Robert Ansell's Maserati and the ERAs of none other than Bob Gerard, Cuth Harrison and a young Roy Salvadori. The success of the inaugural Zandvoort Grand Prix sparked off an almost unbroken run of Zandvoort GPs, followed by Dutch GPs, counting towards the World Championship almost since the series' inception. The track was universally loved for its challenge and looks, and feared for the fearsomeness it required. Loved as well as feared it may have been, but Zandvoort was never loathed for being too dangerous. Not even the cruel deaths of Courage and Williamson could change that. Why? It was a track that allowed you to race. The Dutch motor racing scene may never have figured prominently among the world's best, its track was on center stage for the good of almost 40 years. And with the annual Marlboro Masters attracting the finest F3 talent of the world to the new-style seaside track, it still manages to capture the center of attention once a year. In 1933 the Alfa Romeo works officially withdrew from participation in racing, leaving the private Scuderia Ferrari to uphold their honour. This Enzo Ferrari's team succeeded in doing, and with the advent of the 750-kilogramme Formula the cars carrying his legendary prancing horse symbol fought a gallant rearguard action against the German might. Work at Alfa's own Portello factory was slow in producing an effective answer to the new all-independently-suspended silver cars, and Ferrari's own engineering staff began to work on some prospectively money-making but fearsome 'specials' of their own. Technical director of the Scuderia Ferrari was Luigi Bazzi, and after the Scuderia's annual banquet - on 16 December 1934 - he suggested that a very powerful racing car could be built in a very short time by taking two existing engines and mounting them both in a suitably-modified existing chassis. His calculations indicated that the resultant car would be over the 750-kilogramme Grand Prix weight limit, but it could still earn useful funds in the predominantly Italian-organised Formule Libre events. He was determined not to run into the twinning complications experienced in the Bugatti and Maserati double-eights and the original Alfa Romeo double-six, and so he envisaged his two engines being completely separate, with one at either end of the car to create an even weight distribution. A team under Bazzi and another engineer named Arnaldo Roselli began work in Ferrari's Modena works with the cautious approval of Enzo himself and Jano. They took a new Monoposto chassis, lengthened it by six inches and then boxed it for extra rigidity. The Dubonnet-type independent front suspension then being adopted on the 1935 Grand Prix cars was grafted onto the modified frame, but since both front and rear engines were to drive the rear wheels (Bazzi not being drawn into four-wheel drive) the rear suspension was much more complex. Since the rear engine would be in the way, the normal tubular beam axle of the existing Monoposto had to be discarded, and in its place Bazzi adopted very wide-based fabricated wishbones (resembling the claws of a pair of coal tongs in plan view) which carried the individual bevel drives for each rear wheel. These wishbones were as long from front to rear as were the semi-elliptic leaf springs, and they mounted inside them on the same chassis cross-members. Bazzi turned the rear engine around in the chassis, so that it drove forwards towards the front engine. This unit retained its normal P3 clutch housing and gearbox, with the differential mounted on the gearbox output shaft. Bevels took drive from this differential, and then powered two propeller shafts which diverged towards the rear of the car to provide a vee drive to the individual bevel-box final drives attached to each hub. This was standard practice in the P3 design, but now a second drive from the rear-mounted engine had to be introduced. Bazzi adopted a hollow gearbox main-shaft, and drive from the rear engine passed right through it and on through the clutch centre where it engaged with an internally-toothed union. There was a simple dog-clutch introduced into the drive-line from the rear engine so that it could be disengaged by the driver to leave the car with only the front engine driving the rear wheels. Final major departure from Tipo B layout concerned the fuel tanks, which could no longer reside in the tail cowling and so were slung pannier-fashion on either side of the chassis frame. This feature served to concentrate the vehicle's mass even more within its wheelbase, and meant that its handling should not be altered materially as the fuel load was burned off. There were two separate radiator cores, one for each engine, mounted in the nose, and massive Ariston drum brakes were fitted all round, with hydraulic operation and an extra mechanical hand-lever operating on the rears. Wheelbase was 9ft 2.25ins, track 4ft 6.5ins, height 4ft 6.75ins and overall length 13ft 7.5ins. Two of the cars were assembled, one using the latest 3,165cc straight-eight supercharged GP engines and the other two of the earlier, provenly reliable, 2,905cc units. The larger engines produced 270bhp each at 5,400rpm to provide a total of 540 horse power in the larger 'Bimotore'. The smaller units were rated at 260bhp at 5,400rpm, to total 520 horsepower. Both sizes of engine shared a 100mm stroke, the larger being bored out to 71mm as against the earlier dimension of 68mm. The two cars were bodied in aluminium sheet, formed in classical lines over dural bracing, and with the suspension carefully cowled at front and rear and a prominent tail fin extending from the head fairing, Ferrari's new 'specials' were very striking in appearance. Dry weight was quoted as 2,205lbs, rising to 2,888lbs fully-laden. The smaller car was completed in only three months, and on 10 April 1935 it was tested on a closed section of the Brescia-Bergamo Autostrada by the Scuderia's chief tester, Attilio Marinoni, and Tazio Nuvolari. The champion driver was timed at 175mph on one run at 4,500rpm, and then he booted the new prototype to a brief near-rev limit 5,300rpm on the return run and recorded 210mph! That afternoon the car was taken to Monza Autodrome where it completed quite a long session mechanically trouble-free and apparently quite pleasant to handle. The rear tyres began to show certain signs of distress with sustained high-speed running, and Bazzi instantly realised that this would be a problem when it came to racing the car. Ferrari and Jano both gave their full support at this juncture, and - while the Tunis GP was allowed to slip by - the second, larger-engined car was completed and a two-car Bimotore entry made for Tripoli. The fast North African race took place on May 12, and the two brand-new Bimotori took their places on the 28-strong starting grid with Nuvolari in the latest 6,330cc model and Louis Chiron in the original 5,810cc prototype. Mercedes and Auto Union were present in force, and from the flag Caracciola and Fagioli rushed into the lead with Nuvolari hanging onto their tails with the big Ferrari Alfa. He forced his way past Fagioli into second place, but at the end of his third lap he brought the Bimotore swerving into the pits for new rear tyres! After four more spectacularly rumbustious laps Nuvolari was back again to replace rear tyres worn through to the canvas, and so it went on. He eventually changed eight tyres during the race while Chiron's smaller car had to change six. They were not alone, tyre-changing being an integral part of top-class motor racing in those days, but their consumption was much higher than the opposition's and it cost them dear. Nuvolari was finally placed fourth and Chiron a troubled fifth, but although immensely fast along the Mellaha's straights neither car could match the German cars' nimble handling and meteoric lap speeds. Caracciola won, and his best lap of 136.77 mph in the Mercedes compared admirably with Nuvolari's fastest at 133.78mph. The Bimotore was clever, but far too crude in this company. Europe's fastest race, the AVUS-Rennen, followed two weeks later, and practice saw Nuvolari watching open-mouthed as his tyres stripped before his eyes, whenever he attempted to hold more than 175mph along the narrow straights. 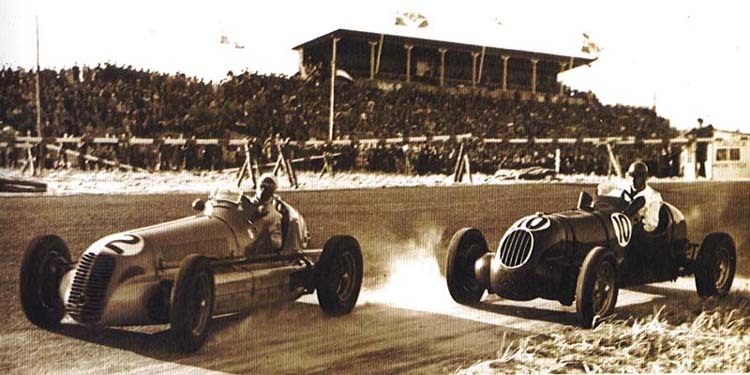 Stuck's Auto Union was a whole twenty seconds quicker while the Italian car consumed its rubber, and yet Nuvolari was not to be cowed by this disconcerting habit and kept his foot hard on the floor in the first five-lap heat. He made his first stop for tyres on the second lap, eventually finished sixth and failed to qualify for the final. Chiron took things more calmly, treating his car's tyres as though they were made of paper, and he qualified for the final by tip-toeing into a comfortable fourth place in his heat. He drove very intelligently in the ten-lap final and while the faster German cars stopped to change tyres he just kept going, easing his way round the corners and feathering the throttle on the straights. Fagioli's Mercedes won, but the Bimotore boomed home in second place with one rear tyre completely devoid of tread. This was the end of the Formule Libre season, and so the Scuderia turned to record-breaking with its twin-engined cars. On February 14 Hans Stuck had set a new flying mile record for Class C (3-5-litre cars) of 199mph in his Auto Union on the Florence-Viareggio Autostrada-actually using the level eight-kilometre section between Lucca and Altopascio. Although the big Bimotore was in Class B (5-8 litres), Tazio Nuvolari set about raising the German record on Italian soil. Early on the morning of July 15, the big 6.3-litre Bimotore was wheeled from its transporter onto the Lucca road. It had been modified with a slick head faring and disc covers for the rear wheel spokes. The pannier tanks had been removed and 50kg weight had been saved simply by removing the big tail-mounted oil tank. Dunlop tyres were fitted in place of the original Engleberts, these being 6.50 x 32 rears and 6.00 x 19 fronts. The best time of the morning was past when he got going again at 9.30, thundering away down the arrow-straight Autostrada towards Altopascio. The red car disappeared from sight long before its twin-engine exhaust note stilled in the air. A 200-yard battle for control left its legacy in glaring tyre marks just after an over-bridge where the Bimotore was caught in a sudden cross-wind, but Nuvolari simply wheeled round at the end of the run and came howling back again, correcting another vicious side-swipe to return to a relieved, and soon elated, Ferrari depot. The timekeepers announced that the Bimotore had taken the flying mile record at 200.77mph, the flying kilometre at 199.92mph and that its peak recorded speed through a special trap had been 208.91 mph... The flying kilometre figure bettered the former record set by Caracciola's Mercedes at 197.35mph on the Gyon Highway, in Hungary. Next morning the Autostrada again shuddered to the Bimotore's passing, but the wind had risen and after five increasingly desperate runs Nuvolari gave up. The big car was taken back to the Scuderia Ferrari workshops in Modena, where its engines were removed and it was put into a back stores beside its similarly demobilised smaller sister. One of the chassis was subsequently scrapped, while the other (generally accepted as being the Chiron car) was bought in 1937 by British amateur driver Austin Dobson for national events at Donington and Brooklands. Ferrari installed a pair of 2.9-litre engines for their new client, replaced the Dubonnet front suspension with a more modern trailing-link set-up and shipped the rebuilt car thankfully to England, having made some return on the project at long last. Dobson's appearance with the Bimotore caused great excitement in British motor racing circles, and after discovering that the big car was right out of its element on the twisty road course at Donington Park he broke the Class B lap record at Brooklands' Mountain Circuit, taking it to 77.84mph. He shared the wheel with Fairey Aviation test pilot Chris Staniland in the BRDC's 500-Kilometres race, and the latter lapped the outer circuit at 132.8mph. The Bimotore was placed sixth in this event on corrected handicap. At the close of the season Dobson decided that perhaps the car was not for him, and he sold it to the Hon. Peter Aitken. He decided to modify it for English racing, and had it cut virtually in two, the rear engine removed along with the transmission and rear suspension, and replaced by an ENV pre-selector gearbox with a new back axle mounted on quarter-elliptic springs. This emasculated special was renamed the 'Alfa-Aitken', and it was not completed until the middle of 1939 when it appeared with a brand-new bodyshell with bulbous fairings completely enclosing front and rear suspensions, and an odd almost circular radiator grille high-mounted on the nose. After some brief appearances the Alfa-Aitken was retired for the duration of the war, during which its owner was killed, and postwar it passed to R.V. Wallington who won in it at Gransden Lodge aerodrome in Britain's first postwar race meeting. Wallington sold the car to Major 'Tony' Rolt - one of Colditz Castle's glider manufacturers when a prisoner-of-war - and he had it modified by F.W. Dixon who removed its twin superchargers and fitted eight SU carburettors to make it eligible for what were then 'Formula A' races. Dixon enlarged the surviving engine to 3.4 litres and Rolt raced the resulting 'GP car' quite widely in the late forties. It's only real success was here at the Zandvoort GP where Rolt placed 2nd in both a heat and the final. This 'Monomotore' Alfa eventually found a buyer in New Zealand where it was further abused, winding up with a GMC truck engine installed. It is now in the good hands of Gavin Bain in Christchurch. Meanwhile the original rear engine from the car had been acquired by Lord Ridley, of Ridley Special fame, and later came to the Hon. Patrick Lindsay who fitted it into an engineless Tipo B Monoposto chassis which he had bought from Australia. This chassis (No 5002) was reputedly ex-Nuvolari, and after its emigration to Australia it had been variously powered by 4.3-litre Alvis, six-cylinder side-valve GMC truck, and Chevrolet Corvette V8 engines... at least it, and the remaining Bimotore, have survived!